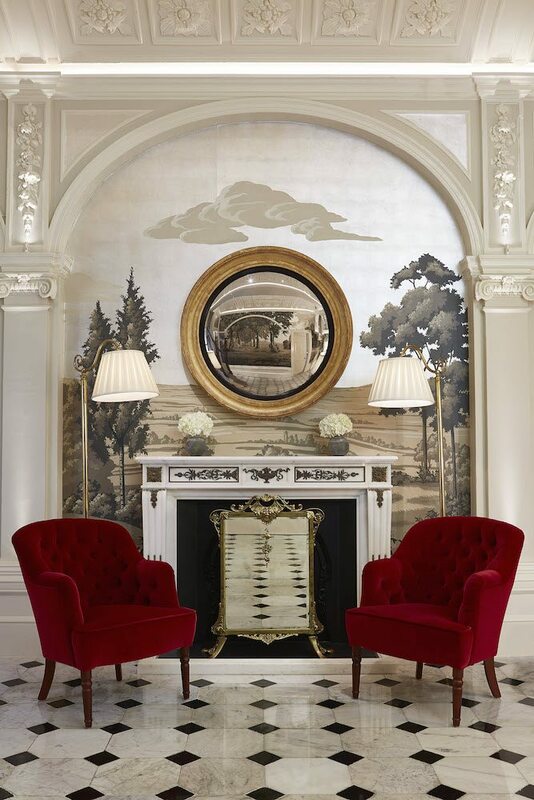 We created a statement scenic wallcovering for the Front Hall of The Goring as part of the hotel’s comprehensive renovation, designed together with interior designer Russell Sage and fourth generation family member Jeremy Goring. The family-owned, luxury Belgravia hotel closed its doors for the first time in its 105 year history to complete its top-to-toe designer makeover. It reopened at the end of February 2015, just in time for its 10th anniversary on 2 March 2015. 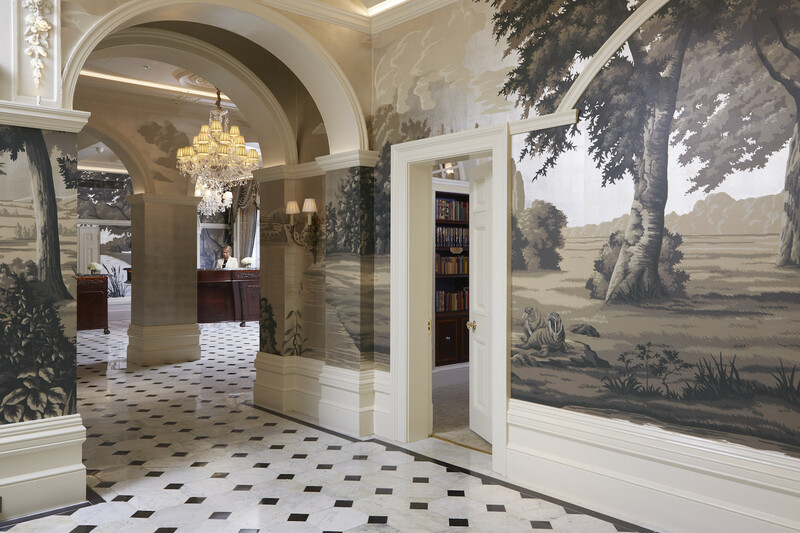 Classical, idiosyncratic and quintessentially British, our scenic portrays an Arcadian landscape enlivened with an anthropomorphised menagerie of wild and exotic beasts, some of which represent members of the Goring family past and present. Entertaining portrayals include Goring founder OR with second in line OG as walruses in bejewelled splendour; the family’s favourite pet pigs engaged in the Battle of Trafalgar, as well as legally trained Goring MD David Morgan-Hewitt as a gorilla in a judge’s wig. 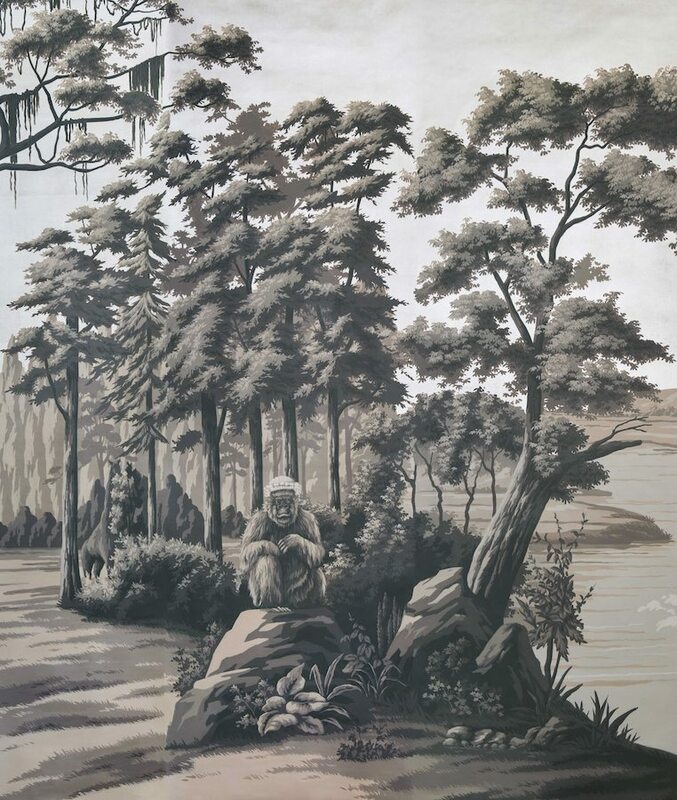 Reminiscent of the grand, French 19th century block-printed papers, the wallcovering is painted on hand-gilded silver leaf on paper, taking four artists around eight weeks to produce.